This traditional, egg-based quiche is packed with flavor. 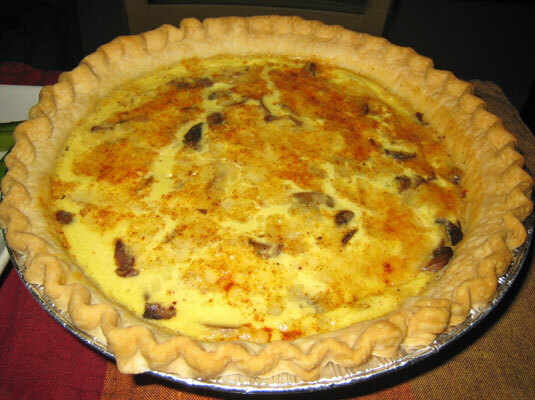 Serve this mushroom quiche for a special brunch to really impress your guests. Accompaniments include fresh fruit or steamed vegetables, and whole-grain toast or muffins. Chop the green onions and thinly slice the mushrooms. In a medium skillet, heat the olive oil. Add the mushrooms, salt, and lemon juice. Cover the skillet and cook over low heat for 10 minutes. Remove the cover, increase the heat, and bring the mixture to a boil. Cook for another 10 minutes or until the liquid in the pan has evaporated. Continue cooking, stirring constantly, for an additional 3 minutes. Break the eggs into a medium bowl and beat them lightly with a fork or whisk. Stir in the milk, black pepper, and nutmeg. Add the mushroom mixture and stir to combine. Set the pie shell on a cookie sheet. Grate the Swiss cheese and then sprinkle it evenly across the top of the quiche. Add a few shakes of paprika for color. Place the quiche in the oven and bake for 35 minutes or until browned on top. Test for doneness by inserting a toothpick or knife in the center. When it comes out clean, the quiche is done. Garnish with tomato slices and parsley sprigs, if desired, and serve hot. Per serving: Calories 344 (From fat 225); Fat 25g (Saturated 7g); Cholesterol 153mg; Sodium 436mg; Carbohydrate 19g (Dietary fiber 1g); Protein 13g.